In creating the course we followed the natural flow of the land, in keeping with our philosophy of sustainability, and we believe that the result is visually striking and a pleasure to play. When we started to create the course, it was just bare fields; now, it is a mature parkland par 3 course. We hope that you will visit us, and will appreciate our course as much as we do! At Blackwater Golf Course we promote an holistic and sustainable approach to golf course maintenance. We believe that nature knows best, and so we treat our course and the nature within it with the respect that it deserves. We do not use harsh chemicals to treat our greens, preferring to use natural methods to encourage the growth of the grasses we want and limit the growth of those we don't. The result? A peaceful and natural course with rich grasses and smooth consistent greens, where the natural balance is maintained. We opened our golf course in 1993. When we started, Blackwater Golf Course was just bare fields. We planted so many trees over the years that the course has flourished into a beautiful and mature parkland course. Since then we have developed the course further, adding touches here and there and continuing our programme of planting to enhance the golfing experience of our visitors and to add to the visual appeal of the course. We believe that it is now one of the finest and most beautiful par 3 courses in County Wexford, and we hope that you will feel the same! Enjoy a great golfing experience on our Par 3 golf course. 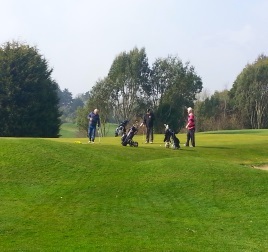 The course is open all year round, and is fun for both beginners and experienced golfers. Test your footie skills on our Foot Golf course! This game is great fun for all the family, and no special equipment is needed. We even provide the football! A unique and popular game created outdoors at Blackwater Golf Course! Foot Pool is played on a large pool table using footballs - the rules are the same as pool!